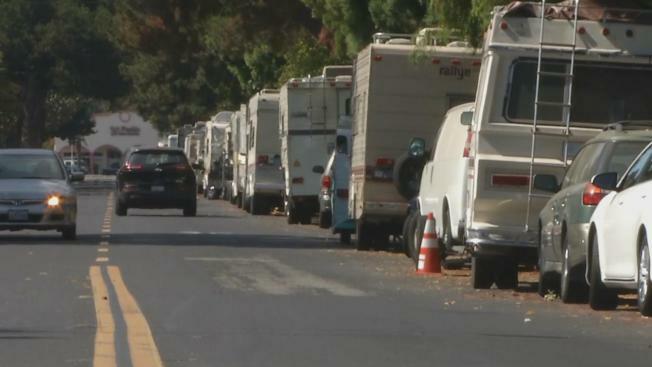 Mountain View city leaders came together Tuesday to address what they called "missing middle housing," a growing problem in which people earning six figures still can't afford a place to live. "New units coming online are asking for rents of $3,700 to $4,200," said Wayne Chen, the city's Housing and Neighborhood Services manager. Skyrocketing rents are driving some of those people to dwell in cars, vans and recreational vehicles. They can be seen lining city streets. City officials said they spent more than $1 million last year supporting vehicle dwellers, with two dedicated social workers, a mobile shower unit and other support services. "The city has taken a humanitarian approach first, and we're trying to get help and services to the people who need it," Mayor Ken Rosenberg said. But the mayor wants to be clear: He said many of the RV residents are service professionals who work full time. "Many of the people are living in their vehicles by choice; many of them work," Rosenberg said. "We refer to them as the working homeless." One of the solutions being considered is building micropads, 110-square-foot homes that can be stacked like Legos. "Micropads and the developers that are looking at that could really address a wide range of needs," Chen said.